The content of the morning shows has been repeatedly brought under discussion on pretty much every platform. 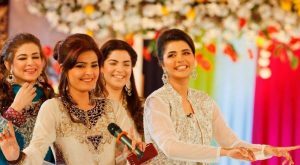 We are well aware of the antics to gather the ratings, where the morality police of the morning show chased unsuspecting couples in Karachi’s part or the live exorcisms, which scared us to death with our morning coffee. No matter how much we talk about it, no matter how much we despise it, the plague of regressive material continues on the morning shows, because it sells. There is no iota of incentive on account of these shows, which shows a change for the better, instead they launch on pathetic reinforcement of clichés, because it sells. My random midnight flicking through the channels brought me to one such show. The reason I continued to watch this particular show in the middle of the night was because I was looking for an ounce of sanity, it is best to say there was nothing there. 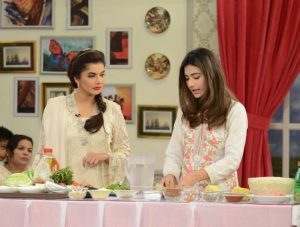 ‘Jago Pakistan Jago’ Hum Televisions leading morning show with a host setting incredible standards in posh dressing was this time on the hunt for the best woman in the kitchen. She and her two sidekicks, one a renowned chef (who with all his expertise failed to realize that it’s called ‘Ravioli’ not ‘Ravaili’. Yes I am judging him over his pronunciation, because if he thought himself to be entitled enough to pass judgments on the women who cook every day of their lives, then he must be judged on his expertise and isn’t that the deal in the culinary school that you need to name the thing right, before you even try to make it?) And another woman, who inexplicably was there to make every woman in the kitchen feel bad about herself, as she was taking the lead in telling everyone if the garam masala is not hand grinded to perfection in two minutes, then you have lost it at domestic life. 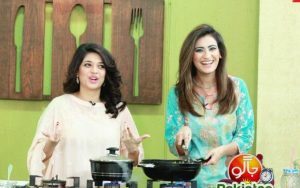 The main aim on the show was to find the woman on the show was the cleanest and the most efficient in the kitchen or in the local terms ‘Sugghar’. The ladies were given two minutes to do the tasks like grind the spices, separate the eggs or make the chutney. 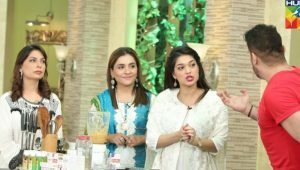 Well it is safe to say all of the women on the show failed to cater to the standards of Sanam Jung and her two sidekicks, who over the night became the Matt Preston of food critics in Pakistan. This was not the only thing that angered me during the entire show, occasionally the audience burst into a tirade against a contestant and her kitchen skills, and lets just say the two incredible sidekicks did not disappoint. Now I know, these woman posing as contestant might be actresses or paid to act in a particular way, or this entire show was a set up. But, there is no explanation of why a woman who cooks for her family every day of the year should be brought under such a scrutiny and why we must enforce the cliché that if a woman is unclean or inefficient in the kitchen she has failed altogether as a woman and her womanhood is ashamed of her. The entitled chef was out there spelling out critiques to the women on how they have failed. Little did he realize that the women in the kitchen are not the graduates of a culinary school, they have developed their skills on their own, not working in a professional kitchen but around the needs of a home, while juggling children and a family. Her life does not depend on the tenderness of pasta but getting the food on the plate while the children cry on other end of the house. Why is this a problem and why does it affect me emotionally? It is a problem because all it does is to show a woman usefulness only being limited to the kitchen. It shows that all that a woman should worry about is her efficiency in the kitchen and it also shows that there is little incentive to our television people to show a progressive woman. I belong to home where my mother cooked meals and fed her children properly, it angers me that her legacy of a perfect mother gets tainted by a mere fact that she was not pristine clear in the kitchen. It angers me to see a channel that has a woman at the helm come up with such regressive ideas against women. The shows are another story, but isn’t it the same case there? If the woman is not in the kitchen, worried about her wedding or her life revolving around a cliché, then she is incapable of being glorified in any positive way. This is the message we impart to the women of our country, and sadly this message sells the most. I am a man and it aches my heart that our television industries led by these unregulated morning shows are reinforcing every stereotype against the woman. Why complain to men for their chauvinism, when we have women on television doing exactly just that. Oscar, fighter pilot, doctor or a revolutionary, these things are pointless unless your kitchen is spotless, that is the woman we idealize and sadly that is the woman that shall sell.